The NTSB (National Transportation Safety Board) has issued a preliminary report on the fatal accident involving an Uber self-driving test vehicle and a pedestrian walking a bicycle. According to the report "the self-driving system, consisted of forward- and side-facing cameras, radars, Lidar, navigation sensors and a computing and data storage unit integrated into the vehicle. The vehicle was factory equipped with several advanced driver assistance functions by the original manufacturer, Volvo, including a collision avoidance function with automatic emergency braking as well as functions for detecting driver alertness and road sign information. The Volvo functions are disabled only when the test vehicle is operated in computer control mode." The report states "data obtained from the self-driving system shows the system first registered radar and Lidar observations of the pedestrian about 6 seconds before impact, when the vehicle was traveling 43 mph. 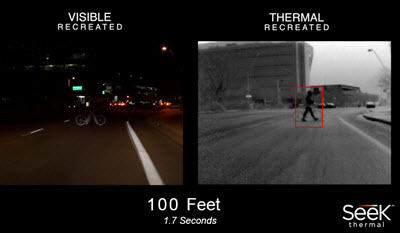 As the vehicle and pedestrian paths converged, the self-driving system software classified the pedestrian as an unknown object, as a vehicle, and then as a bicycle with varying expectations of future travel path. At 1.3 seconds before impact, the self-driving system determined that emergency braking was needed to mitigate a collision. According to Uber, emergency braking maneuvers are not enabled while the vehicle is under computer control to reduce the potential for erratic vehicle behavior. The vehicle operator is relied on to intervene and take action. The system is not designed to alert the operator." It took the system 4.7 seconds to conclude that the object detected was a bicycle and by that time the collision was 1.3 seconds away and unpreventable. Clearly the system did not respond in time. 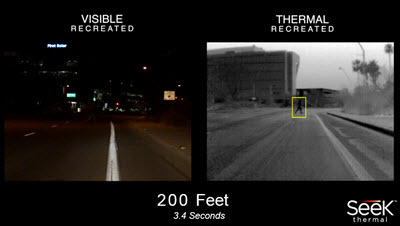 In order to see how thermal imaging would have helped in this scenario, Seek Thermal sent a team to Tempe to recreate the accident. Below are images made at various times before (simulated) impact. 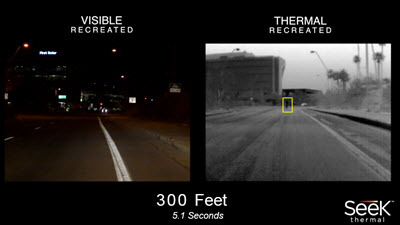 The sequence shows both visible and thermal images (320 x 240) starting at a distance of 300 ft before impact (5.1 seconds) to 100 ft before impact (1.7 seconds). 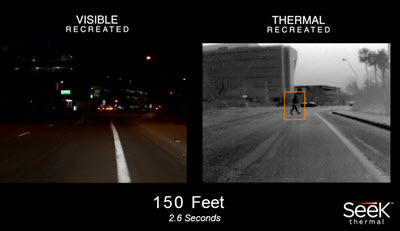 It can be seen that even at 5.1 seconds before impact the thermal imager was able to spot the pedestrian. 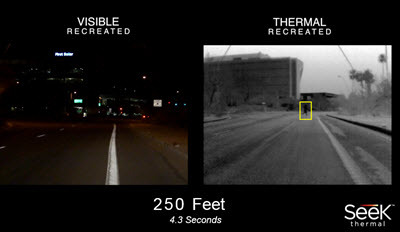 [Editor's note: This is an illustration of the value of thermal imaging in autonomous vehicles. It will not replace the Lidar and radar sensors currently being used but including a thermal sensor could add an extra layer of safety.